Paget's Talkies is an almost forgotten page of Australian Movie History. The company was established in 1908, taking Silent Films on tour to remote country towns in Queensland. 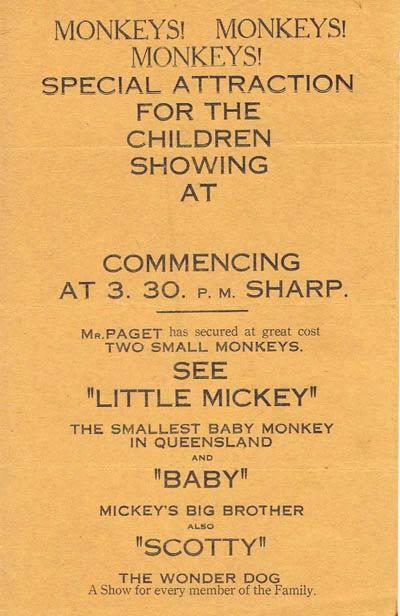 Very little is known about this chapter in Australian Film history but the brochures, flyers and advertising material that have been found indicate that Paget's played a fascinating role in bringing movies to the country. Towns like Blackbutt, Pialba and Nanango are mentioned in the advertising. Paget’s adapted to the introduction of sound and purchased equipment that was able to bring Talkies to the country towns. In many cases, this was the only chance for farming communities to see the latest movies. The familiar headlines of “See and Hear Paget’s Talkies” featured proudly on many of the brochures of the early '30’s. Paget’s continued through the early-mid 40s changing their name to Paget’s Pictures. This collection of Flyers and Advertising brochures represents a part of Australian Cinema history that has been sadly neglected and almost forgotten over the years. "SEE and HEAR his TALKIES. Brilliant, wonderful, Supreme, the Talking is a revelation." "It has been said that it is impossible for Talking Pictures to be taken on tour. Paget drops a bomb among the critics with his wonderful Touring Talkie Show." "It has been acclaimed as the most wonderful Show ever seen equipped with AUSTRALIAN IMPROVED AUDIOTONE costing £3000.00 to install." "A Bigger and Better show than ever. Remember its Paget's Genuine Talkies. Established Silent 1908 Talkies 1930 Overture 7:45pm." "Pagets lead the way with Silent, now he leads the way with TALKIES. The first complete AUSTRALIAN Talking Picture equipment is now a part of the magnificent machinery of Paget's truck which cost £3000 to install." "Boon to the Country Bringing the Modern Entertainment of the Big Theatres to the small Country Towns"
"Racophone's Latest high fidelity Talking Picture Plant in two units. No delays! Two machines. The best talking plant touring Queensland costing £2000.00. Come and hear it. Paget has now the best. And what a program!" "Pagets, equipped with the Latest Dual Raycophone Sound System. Remember, it's Paget's. See Paget's Beautiful new Touring Car." "Remember its Paget's. Always FIRST with the LATEST AND BEST." "PHOENIX THEATRE BLACKBUTT Saturday 6th March LUCKY GIFT NIGHT. Presenting a big 3 STAR PROGRAMME Also, 2 presents given to lucky patrons." "Presenting one of the GREATEST DOUBLE FEATURE PROGRAMMES ever presented to our patrons.THE FILM HITLER DOES NOT WANT YOU TO SEE." "The Lion Has Wings - Showing for the first time the daring raid on German battleships in the Kiel Canal by British Bombers. THE PRIME MINISTER (Mr MENZIES) STRONGLY RECOMMENDS THAT EVERY AUSTRALIAN SHOULD SEE THIS TRUE AND WONDERFUL FILM."